We host rockin’ square dances at Saint Stephens Church in DC’s Mount Pleasant/Columbia Heights neighborhood. Every dance has a live caller and live music. Our dances are open to all ages and experience levels. No prior dance experience, lessons or special getups needed. Just come out and dance! The D.C. Square Dance Collective holds its first ever Family Dance! If you have been meaning to come to a DC Square Dance but couldn't find a baby sitter, this dance is for you! A fun and affordable weekend long getaway! May 17-19, 2019, Prince William Forest Park. Nightly dances, day-time workshops, learn to call your first dance or hone your calling skills, enjoy old-time instrument and singing sessions, learn clogging/flatfooting, and more! Use this form to sign up for updates on our dances! We won't share your information, and we will only use this for occasional notifications of events. The DC Square Dance is intended to be a safe, welcoming space for all dancers. Disruptive, aggressive, threatening, harassing, dangerous, or inappropriate behavior has no place here and will not be tolerated. We encourage a culture of proactive consent: If you are unsure whether a particular dancer wants to interact with you in a particular way, ask. Used to be that square dancing could be found in almost any American city or town, danced by young and old, black and white, urban and rural folks alike. Today, it’s making a comeback as people re-discover the joy of a foot-stomping, rollicking, barn-shaking dance party. Never been square dancing before? Don’t worry! It’s easy to learn and requires no previous experience. You don’t need to bring a partner or wear any special outfit. We always have live music and a caller to walk you through the dances. Check out this video for a glimpse of what the dance is like. 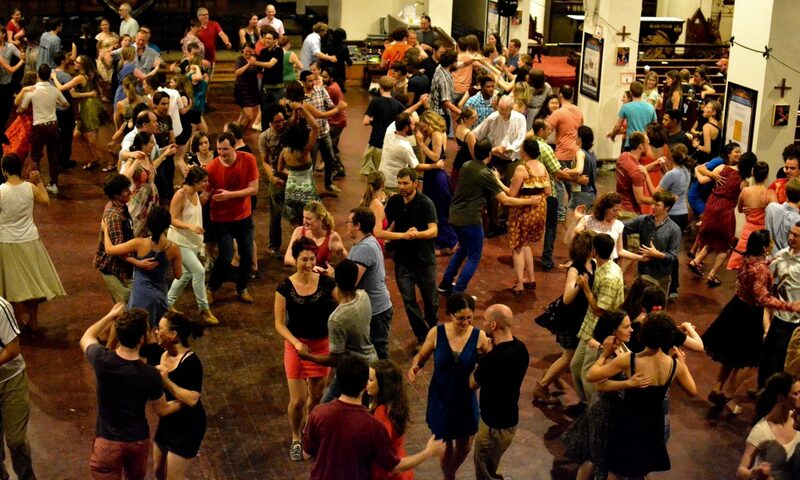 The DC Square Dance Collective is a group of music and dance lovers who volunteer their time to make the dance happen. We are, in no particular order: Janine Smith, Bradley Kennedy, Gabe Popkin, Kaythi Han, Stan Fowler, Michael Lyons, Brent Feito, Andrew Hunt, Dave Hauver, Anna Purinton, Joel Bluestein, Don Fahey, and Lucia Schaefer. Past members include Paul Brown, Julia Feder, Rose Mohan, Brandt Ryder, Kaitlin Rienzo-Stack, Scott Prouty and Cynthia Connolly. We’re looking for new Collective members! Email dcsquaredance@gmail.com if you’re interested in joining or to learn more. Please email dcsquaredance@gmail.com if you are interested in calling or playing our dance. We are a part of the Folklore Society of Greater Washington. And we couldn’t do it without the help of the wonderful folks at Saint Stephens Church.